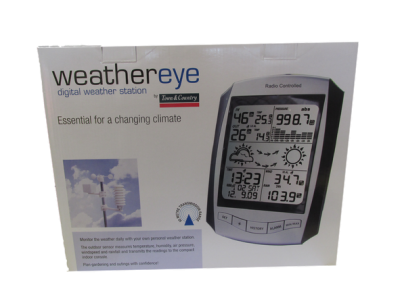 The deluxe weather station has all of the features you need for monitoring the changing weather from your own home whenever you need to know. It is ideal for the gardener, researchers or simply for planning a day out. The compact electronic console offers a clear and easy to ready display with all the information you need available at a glance. Alert alarms can be set to warn of frosts that may damage seedlings or high winds which could damage outdoor equipment, keeping you informed and prepared. The outdoor thermo-hygro sensor remotely transmits data to the console via radio transmission.